Two days after aborting the first attempt to deploy a spare room at the International Space Station (ISS) following some troubles, NASA has successfully expanded and pressurised an add-on room. Two days after aborting the first attempt to deploy a spare room at the International Space Station (ISS) following some troubles, NASA has successfully expanded and pressurised an add-on room. 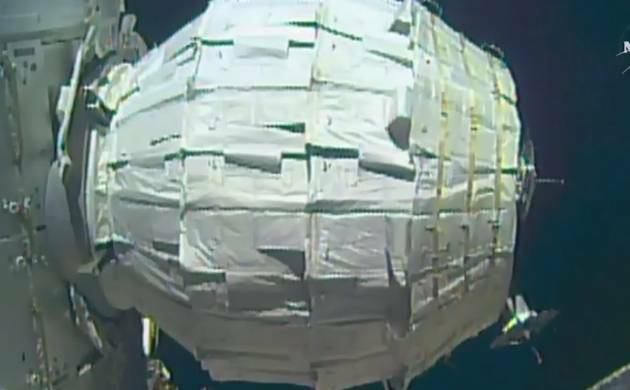 Known as the Bigelow Expandable Activity Module (BEAM), the flexible habitat slowly extended 67 inches (170 centimeters) at 4:10 pm (2010 GMT) and completed following more than seven hours. Short blasts of air into the pod’s walls from the orbiting lab were released by astronaut Jeff Williams using a manual valve. This was done while the BEAM was extending. A series of tests will now be performed by the astronauts, who will ensure that the air is not leaked from the pod. They will also do other preparations before making it enter through the station’s Tranquility module for the first time in approximately a week, NASA said. Because it takes too little air to bring the pod to full size, the inflation process is better described as “unfolding”, said experts. In order to expand BEAM to its full shape, only about 0.4 pounds per square inch (psi) is required. Live video feed from the space station on NASA television revealed that a popping sound was caused by the expansion not unlike that of popcorn as the structure slowly filled out. Expandable habitats that may be used on the Moon or Mars in the future are being tested by NASA. The attempts to inflate the flexible habitat started around 9 am (1300 GMT) after the first efforts were failed on Thursday. The reason for failure was too much friction between the pod wall’s fabrics, possibly because it had been left packed longer than originally planned. Throughout the two-year technology demonstration to retrieve sensor data and assess conditions inside the unit, including how well it protects against space radiation, the astronauts are expected to re-enter the module several times, the US space agency said. Bigelow Aerospace developed the first-of-its-kind habitat as part of an USD 18 million contract with NASA. Fully expanded, the module is 13 feet long (four meters) by 10.5 feet (3.23 meters) wide. Expandable habitats’ benefit lies in the little space they take up in spacecrafts’ cargo holds while providing greater living and working space once inflated.